Nurmagomedov’s early days in fighting are famous in Dagestan. Having first learned how to walk on a gym mat, the lightweight phenom was destined for a life in the fight game. 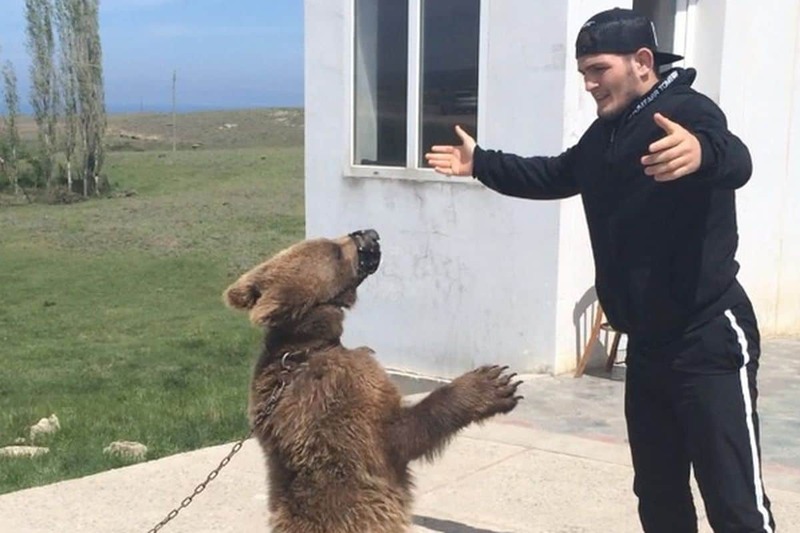 At just 9-years-old, and led outside the gym by his father, Khabib was shown a bear cub by the name of Toblerone, who had been harassing local village kids and being a general nuisance. “I feel he take all glory, and I don’t feel this, eh, glory and praise is earned until he do battle with me, one more time. Everyone know Khabib; everyone love Khabib, around the world, for he is now UFC champion,” Sokolov told us via an interpreter. “Make fight with Khabib and give me chance to take him to places he never been before. OK, so he fight Al Iaqunita and beat him for title? Iaquinta is not even top 10 in division. He is fraud and did not beat McGregor or Ferguson yet number 1? I have no understanding of this sh*t”. With such tangible disappointment in Toberlone’s voice, it is hard not to sympathize with his views. This is a bear who truly believed that he would one day be enjoying the fruits of a successful fight career, and the adulation and love of his people. Having shown great promise as a young boxer and sambo fighter, he believes that the shame inflicted on him by the Nurmagomedovs was enough to push him into quitting his dreams at a young age. “I run away to circus, man,” he said. “I gave up dreams of fight to travel, cos I was ashamed, brother. My family never looked at me the same. My father called me derogatory names, like Paddington Bear, or Yogi Bear. I was told I was embarrassment to bears. You know, I thought I won the fight. Khabib know that I went easy on him, I take him not too seriously as I thought ‘hey, he too small’. Look now – I work as f**king car mechanic while Khabib is star. I am true star, I am true fighter. “This guy take everything, motherf**kers. Hey, Khabib Nurmagomedov, I fight you motherf**ker. I not surprised, motherf**ker. Do right thing and fight me to show you true king and not number one bullsh*t. Let’s do it, man, and show world that you are not afraid to fight the best. Otherwise who you fight? McGregor? Bork Lester? Tony Ferguson will never happen. Man he got beat up by cable. Come fight me and lets do this. Is Conor McGregor getting Stripped of UFC Title in the Plan?